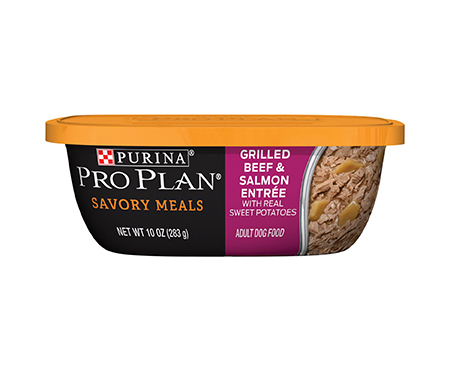 Delight your dog's taste buds with Purina Pro Plan Savory Meals Grilled Beef & Salmon with Real Sweet Potatoes, and give him a nutritious mealtime option. 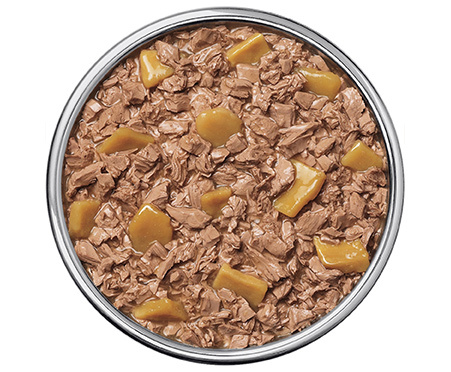 Featuring real beef and salmon for a protein-rich recipe your dog will crave and love. This wet dog food includes omega 6 fatty acids to help promote your pal’s healthy skin and coat. With high-quality ingredients, this savory recipe is part of a complete and balanced diet that helps support your adult dog's total well-being. Plus, the moist and tender recipe includes 23 essential vitamins and minerals to help support his overall health and well-being. 100% complete and balanced diet with real beef and salmon specifically formulated to support a healthy, active lifestyle for your loving pal. Omega-6 fatty acids help to promote his healthy skin and coat, while essential vitamins and minerals help to support his overall health and wellness. High-quality protein helps build and repair muscles and other body tissues, plus helps provide the essential building blocks your buddy needs. Delicious taste with real meaty chunks that dogs love, plus a savory broth to add moisture and added flavor.